I am in the midst of an all out crochet-fest! I just can’t stop crocheting things! I have been out buying yarn like crazy for the past few months, as if the world’s supply of yarn will end in two days and I don’t want to be the only one left with nothing to wrap and loop into something spectacular. Thank God for printable coupons on the internet, is all I can say. My hands haven’t cramped up quite yet while I’ve been fashioning more wraps and scarves and hats than we could ever wear in a season. I love wearing the things I make. I especially like the uniqueness of making something myself. There’s nothing worse for a woman than going out and seeing someone else wearing the exact same thing you bought because you thought it looked great on you, only to discover the middle-schooler at the movies was thinking the exact same thing about herself in that blouse. That actually happened to me once. I was probably in my mid-twenties and I saw a 14 or 15-year-old wearing the same top as me at my husband’s nephew’s wrestling meet. How embarrassing! (Almost as embarrassing as the amount of times it took me to spell embarrassing correctly. But, hey, now I should be able to spell it more easily next time!) I vowed then to start sewing more often in an attempt to make sure that never happened again. And that’s why I like making my own things. My daughter wants to start an Etsy shop and says she will help make things. Only, so far, she’s made two hats in comparison to my numerous accessories — one of which she is keeping for herself. The other, well, let’s just say she needs some more practice. 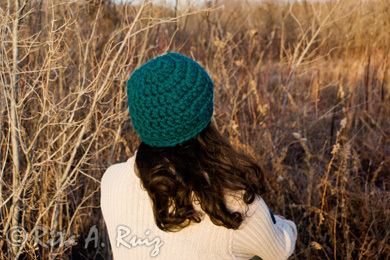 I made this hat in a chunky yarn with a large hook. I really didn’t have a pattern for this one. I just started my little ring and kept going round and round till it was the size I wanted. I’ve just been doing it for so long and so many times that I often don’t use a pattern. I just start something and see how it comes out, having some sort of an idea what I’m going for. I saw a couple of hats with the bigger yarn and I liked them, so I thought I would try one for myself. The color was what attracted me to this particular yarn. It’s perfect for this time of year. Take a look and try one yourself! This entry was posted on January 10, 2012 by rtcrita. 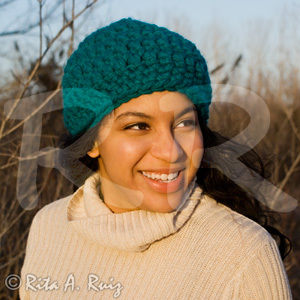 It was filed under Uncategorized and was tagged with chunky crochet hat, chunky yarn, crochet, crocheted hat, hat image, large hook, photography, teal yarn, winter hat. This looks great! It’s so much fun to make your own accessories right? I like to knit, mostly scarves because I can’t really do much else but that’s ok. I hope you will post some more pictures of the other things you made! You’re right, it IS so much fun to make your own things! I envy those that can knit. I want to learn how because there just seems to be so many more patterns for knitting than crocheting. Then again, I always seem to find something to crochet when I want to make something out of yarn. I will definitely post more of the things I’ve been making. I’m up to about 7 shawls and at least twice as many hats! Getting ready to start another shawl tonight in a bright lime-green color. Been thinking about the next season already! Stop! This blows me away! I love it. And of course you combined it with your wonderful photography. Happy new year sweetie-pie. Hey, lady! Happy New Year to you, too! Things have been crazy for me for the past few months, but definitely been thinking about doing some catching up with everybody again. Been wondering what you’re up to lately and am going to fix some hot chocolate with whip cream and do some peaceful reading (and probably lots of laughing!) this weekend! And don’t you know you are going to be one of those at the top of my list! Yes, time is sometimes hard for me to find to do the things I really want to do. I will stay up late (too late) at night to get something done. I think it’s great you make things out of “other things.” It’s a good idea. I have used old clothes for piecing something else together or for the lining in a purse. Much cheaper than buying brand new fabric when I just need a small piece. And you’ll learn how to crochet when you have the time. Just start with something simple. Good luck! Very ambitious of you! Congrats on your hat! Nice color! I never picked up crocheting but I do knit, when I can sit still long enough to do it. I missed my knitting group today, too busy with January house organizing. I love shopping at this one particular little yarn store here in town. They have all kinds of groups that get together just to work yarn into something gorgeous. All the women always look like they are having a good time. I think I will join in one day.